For a relatively small island, Sri Lanka has a big history, and much to recommend it. It’s the world’s oldest Theravada Buddhist country and contains eight UNESCO World Heritage Sites—several of them the former capitals of Sinhalese Kings. With it’s range of ecosystems from coastal wetlands to tropical rainforest and high-altitude cloud forest, it’s a wonderful destination for birders, hikers and for wildlife viewing. The entire island is ringed by white sand beaches and the warm waters of the Indian Ocean—which draws surfers, divers, whale watchers and beach goers from all over the world. The Royal city of Anuradaphura ruled supreme for 1,000 years until it was conquered by Tamil invaders in the 10th century. Today it remains a magical place—of palaces, shrines, dagobas—built on the site of a transplanted branch of the Bodhi Tree under which the Buddha gained enlightenment. There are actually five caves that until recently were lived in by monks, dating back to 100 years B.C. 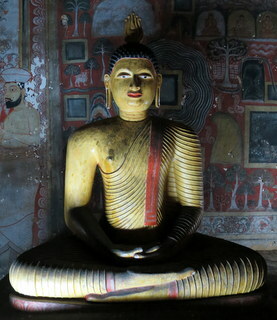 They are a treasure trove of statues and murals that represent Sinhalese Buddhist art at its finest. One of Sri Lanka’s most dramatic sights is the royal palace and fortress of Sigiriya Rock. 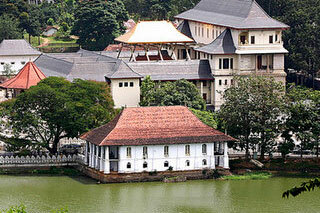 It was built by a Sinhalese king in the 5th century and it rises an impressive 660 feet from the jungle below. At the top of a 1,200-step climb, you’re rewarded with water gardens, a boulder garden, and a commanding view. At the base are a series of caves which hold stunning frescoes known at the Sigiriya Damsels. 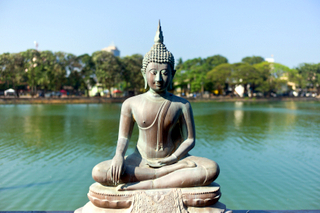 The great ruined capital of Polonnaruwa is one of the highlights of a visit to Sri Lanka. 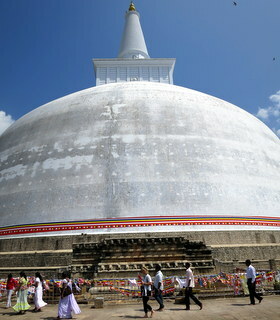 In its heyday (in the 12th century), it represented the height of Sinhalese civilization. It was later taken over by the Hindu Tamils from southern India, which is why one sees both Buddhist and Hindu temples in the city. It was abandoned to the jungle for more than seven centuries, but today it’s again a pilgrimage site for Buddhists. The cultural capital of Sri Lanka was an independent kingdom up until the early 1800’s, which managed to fight off both the Dutch and the British. Visit the Temple of the Sacred Tooth in the royal palace complex—considered the most sacred site for Sri Lankan Buddhists and the Royal Botanical Gardens at Peradeniya. The gardens hold more than 4,000 species and are a lovely place for a walk and quiet contemplation. Don’t miss taking in a cultural dance and drumming performance. Colombo is the country’s biggest port, and a sprawling city along the western seaboard that was first settled by Muslim traders in the 15th century. The city is a crossroads of tradition and modernity whose main bazaar—the Pettah Market is a colorful, chaotic, frenzy of activity that makes for a fascinating visit. All international flights arrive at nearby Bandaranaike Airport. 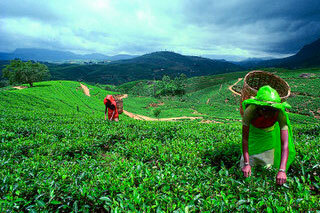 Much of the southern hill country around the town of Nuwara Eliya is cultivated in tea plantations that were originally established by the British. The town itself has a bit of bygone British charm, but it’s the vivid green of the surrounding tea estates that are the big draw—from a pick-your-own experience to formal tea tastings. Off the tourist path, due to its remote location near Yala National Park, Kataragama is an important pilgrimage site for the island’s Hindus, Buddhists and Muslims. Visit for the evening Puja when pilgrims bearing offerings descend on the Sacred Precinct where musicians play, and people dance in a festive devotional display. At the heart of the modern city, but quietly detached from it is the historic Dutch Fort district. It’s a time warp of Dutch architecture – homes and churches date back to the 1700s. Walk around quiet streets, as the entire district is traffic free. 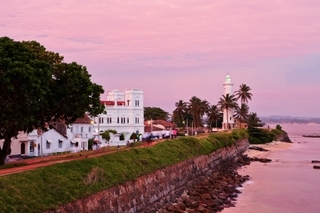 Galle is also the center of gemstone cutting and woodcarving. A superb deep-water port with a sleepy fort and quiet colonial charm, Trinco’s predominant Tamil population means that there are many colorful Hindu temples and a decidedly Indian flavor in the restaurants, music, and culture. This is the gateway to stunning and little-visited beaches along the northern coast near the towns of Uppuveli and Nilaveli. Minneriya—If you only have time for one park, this is an easy one to get to, located in the cultural triangle near Sigirya and Dambulla. On a morning jeep safari you’re very likely to see elephants. Horton Plains—Covers a wild stretch of high-altitude grassland – the best place on the island for bird watching—from colorful Bea Eaters to the many endemic species. It’s one of the few parks where hiking is allowed, with one of the best hikes being the dramatically plunging cliffs of World’s End. 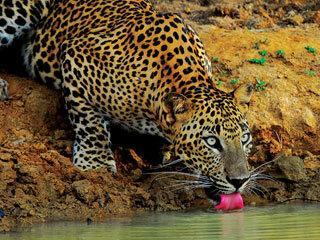 Yala—Yala has one of the highest leopard densities in the world and a beautiful setting along the southeastern coastline. The number and variety of birds, elephants, crocodiles and monkeys also make it the island’s most popular park. 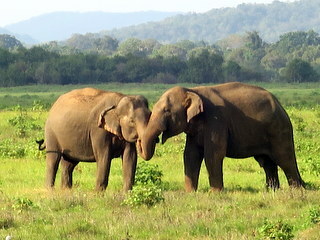 Udawalawe—Located at the base of Horton Plains, this lowland park is another great place to see elephants in the wild, along with hundreds of water buffaloes, birds, purple-faced langurs, macaques and deer. Sri Pada—Within the Sinharaja Forest Reserve, Sri Pada (which is also known as Adam’s Peak), is held sacred by Buddhists, Hindus, Muslims and Christians alike—with the claim that the footprint shape in the rock at the very top was made by Buddha, Shiva, or Adam. Climb the steps in the early morning hours to reach the top in time for the sunrise. The best time to visit the west coast, hill country (Cultural Triangle & Kandy), and the southwest coast beaches are from December to March. For calm seas and good weather on the east coast (Trincomalee) it’s best to travel from April to September.